This Vivienda II villa is an absolute gem! This maintenance free two bedroom, two bathroom villa offers a split floor plan. The kitchen was updated with new cabinets in 2014 and has ceramic tile flooring. The refrigerator was new in 2016 along with the microwave and garbage disposal in 2014. The breakfast bar features a large pass through to the kitchen with space for bar stools and is perfect for entertaining with the dining area located just steps off the kitchen. The dining room and living room both have beautiful wood laminate flooring. The large living room has sliding glass doors that lead directly to the 250 square foot screened lanai which is partially covered and recently rescreened. The master bedroom ensuite has new carpeting, a walk-in closet and a master bathroom with upgraded cabinets with soft close drawers, a granite countertop, dual sinks, new fixtures and lighting as well as a walk-in shower for convenience. The guest bedroom also features an upgraded attached bathroom with a granite countertop, updated cabinet with soft close drawers and new fixtures. The garage has a new door opener and hardware and the floor was redone. Low condo dues include exterior pest control and Sentricon preventative system for termites. roof repairs and replacement, exterior paint, heated community pool and lawn maintenance. 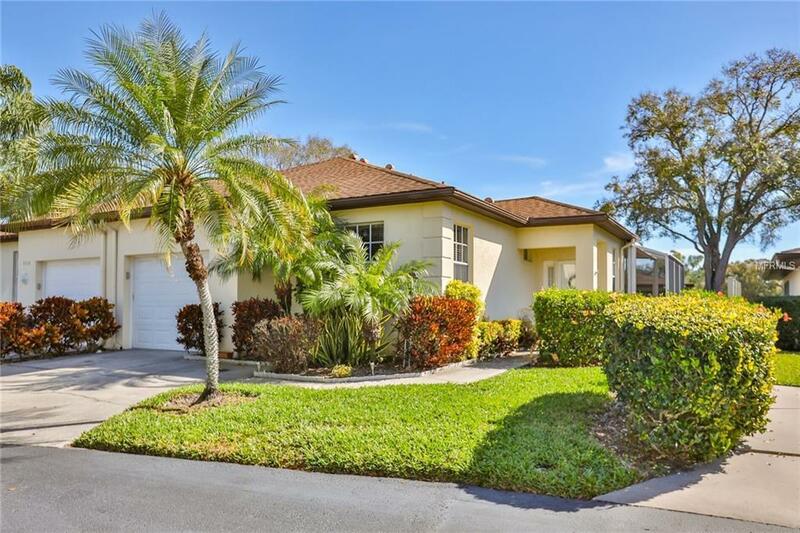 Centrally located to IMG Academy, State College of Florida, Target, Publix and easy access to Bradenton Beach. Being sold As-IS.